Our philosophy is to design, manufacture and install unique soft contained playground attractions that offer superior value through return on assets, superior footprint – capacity characteristics and use modular softplay designs that incorporate our unique kiddie ride, foam ball shooters and electric trackless train products. We strive to develop children and family entertainment products that promote healthy lifestyles and support green initiatives. 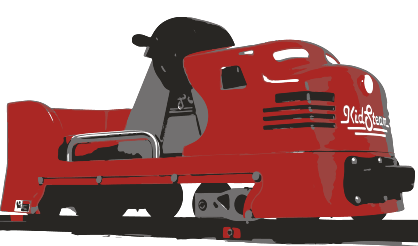 We control the entire indoor playground equipment supply chain and we are North American made. This enables KidSteam to provide the best overall value (cost, quality, installation time) to our clients. We are the only US based indoor playground business that controls all aspects of the supply chain from design through installation. We have sold our products on six continents and within thirty-six countries. Design- We will make a free 3D design of your unique playground. We have in house indoor playground designers that can work on developing a unique indoor playground for your venue. We have over two hundred indoor playground designs in our catalog. We can leverage these designs to begin to make a unique indoor playground for your venue within 24-48 hours after receiving your architectural renderings. We can offer up to thirty plastic colors, a dozen foam pipe colors, a dozen PVC colors, and we can produce fiberglass components in any color or design. 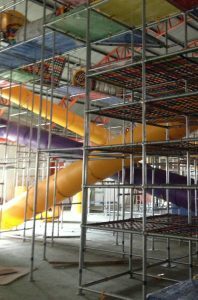 Manufacturing and Inventory- We manufacture and warehouse soft play components in the USA and Asia to allow for quick delivery and installation of our products anywhere in the world. We use just-in-time manufacturing techniques in our soft play manufacturing operations. We can pull many of our designs directly from stock and have them delivered and installed within just a few weeks. 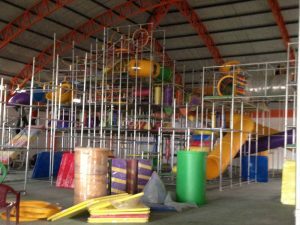 Logistics and Installation – We control all aspects of your indoor playground project including logistics and installation – We use USA based indoor playground installation teams to ensure compliance to applicable US and European safety standards for indoor playground systems. We also have installation teams based in Europe, Asia and Latin America to service these markets. KidSteam prides itself on designing unique interactive soft play events and kiddie rides. 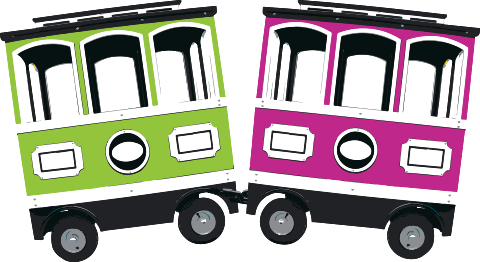 We incorporate these unique products such as our kid-powered train ride, wave slides, electric trackless trains, electric go-karts and foam ball shooters into a single playground. Many of these unique attractions have been spotlighted on the Disney Channel, HGTV and Nickelodeon. We create interactive high volume patron environment within a small indoor playground footprint so that you can reduce the space allocated to attractions. 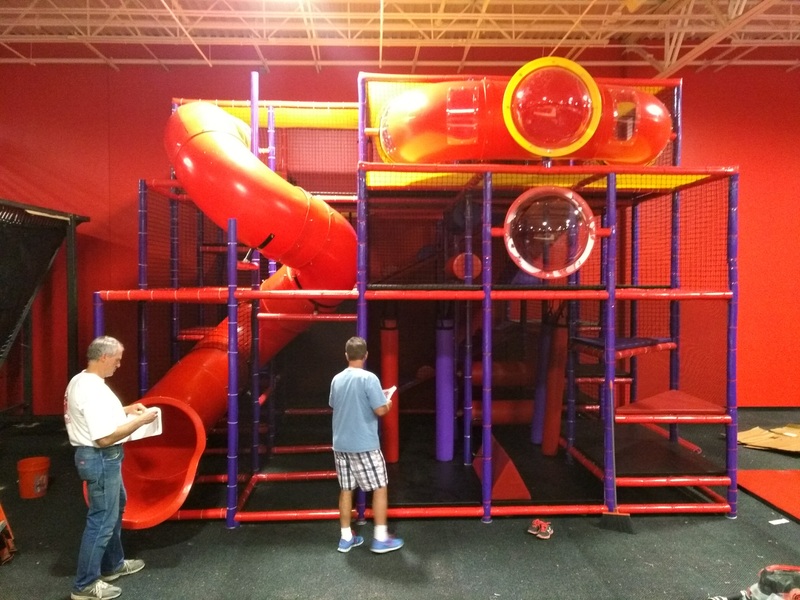 We entertain kids of all ages in thoughtfully laid out indoor playground areas focused on physical interactive attractions at a value turnkey price. We create unique attractions that the entire family can participate in with kids, parents and grand parents participating in activities together. 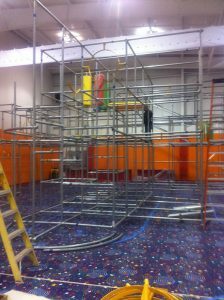 We over specify structural indoor playground components. We have conducted destructive testing on critical components to show that these components meet a design safety factor of greater than 5 to 1. We control quality through the use of detailed soft play specifications, indoor playground manufacturing processes, and 3rd party testing of indoor playground raw material inputs. We are familiar with fire, lead, and phylates testing within different countries. In addition we understand the IBC(International Building Code) regulations associated with our products. 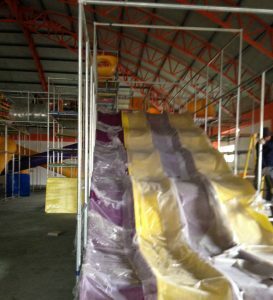 Our background in amusement ride manufacturing has enabled us to set a new standard in indoor playground quality. Please feel free to contact us about specific standards required in your state or country. KidSteam can be ready to ship and install your indoor play system in as little as one week. We have dozens of indoor playground designs in stock, ready to ship and install. The topics below provide details about indoor playground equipment installations. If you need a custom structure and are using a our color palette, KidSteam can complete your design with multiple design iterations, within just a few days and be ready to install in less than two weeks. 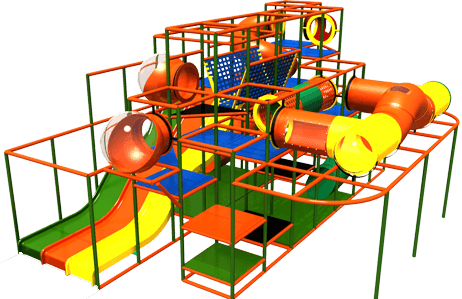 If you are looking for a fully customized indoor playground KidSteam can design, build and install typically in less than four weeks. We believe that the play structure should conform to the room; not the room to the play structure. This design philosophy will help minimize your cost of construction and building design revisions. Many indoor playground manufacturers find it difficult to modify existing designs to fit your room specifications in a timely manner. Kidsteam with our in house design staff can easily modify a design so that it fits appropriately within your unique space. We will provide a 3D rendering of your design within your space. We will discuss any installation concerns with your team and redesign as required. 3DMax – Multiple designers with years of experience. Deep expertise and consulting experience on soft contained modular playgrounds. AutoCad-Solidworks – engineer designers with over 5 years of design-mfg experience within amusement industry. Key skills in design, translating designs into production schedule, management of production, installation instructions, deep skills in pre-installation planning. Consulting – Kidsteam uses international safety experts with years of experience with Fortune 500 companies and experience on standard setting committees. 2D-3D Theming – Kidsteam partners with some of the leading design firms within the church, FEC entertainment and TV/Theatrical space to provide our customers with best in class design services. During the sales process you will be able to speak with our installers and interview them. KidSteam would also welcome the opportunity to perform a site visit so that we may review the site and discuss your project in detail. KidSteam installers are familiar with the latest site tools for installation (IPads and Smart Tablets using Autocad Drawings). Our installation teams will pull your order if from stock and check your order against your design bill of material and review components prior to shipment. Our installers have the expertise to make changes to the indoor playground design on site if necessary. Building measurements often change after the final plat revisions are made by your architect. Adjustments onsite by your installer maybe necessary. It is important to have an experienced installation company like KidSteam that is flexible and experienced at handling these challenges. Our installation team will arrive at your site with our own trucks and enclosed trailers. These trailers contain rolling stock inventory of all the items required to put together your system. This ensures that all the parts required to put together your system are on site. If modifications to the design are required we have the extra parts on site to make these modifications. Our team leads all have commercial contractor backgrounds and are familiar with working with other tradesman and your general contractor to ensure a smooth installation. Construction timelines constantly change forwards and backwards. Our superior design to installation lead times and Dallas manufacturing-warehouse facilities ensures that your playground does not arrive to site prior to when it is needed. 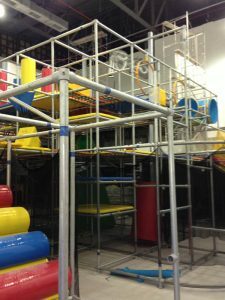 If your project is delayed we can hold the indoor playground at our manufacturing facility until it is needed at site. This ensures that items are not misplaced, damaged or lost while waiting for assembly at your construction site.  We will provide to you an estimated cycle time to complete your indoor playground installation. Once the team arrives on site they will continue to work on site each day until completion. We are familiar with having to work night shifts or completing accelerated installations over weekends in retail-service operations (health clubs and day care). Upon completion of the installation our KidSteam team lead will review the owners manual and daily, weekly, monthly checklist with you. These documents are very useful and can become an additional part of your Standard Operating Procedures at your facility. KidSteam will review the safety checklist and use this document as the customer sign off and approval of the indoor playground installation. Any action items that are identified will be signed-off on by KidSteam and the customer at this time (punch list). This process ensures that a proper installation has taken place and the playground is in working order prior to KidSteam leaving your site. In addition it allows KidSteam to provide some daily operating parameters that will help you operate the indoor playground safely on an ongoing basis. Installers with over five years field installation experience on small and large indoor play grounds. Includes on-site lead supervisor for installation crew and project management from start to finish.